Sew Festive Handmade: Is it autumn yet? Time for a Renaissance pillow! I have a backlog of some projects that I thought I'd share here. 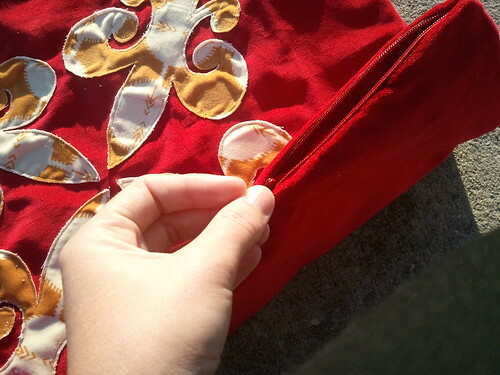 First up, my first foray into sewing with velveteen and metallic thread! It was a smidge bright out when I took the pictures, so please bear with me. 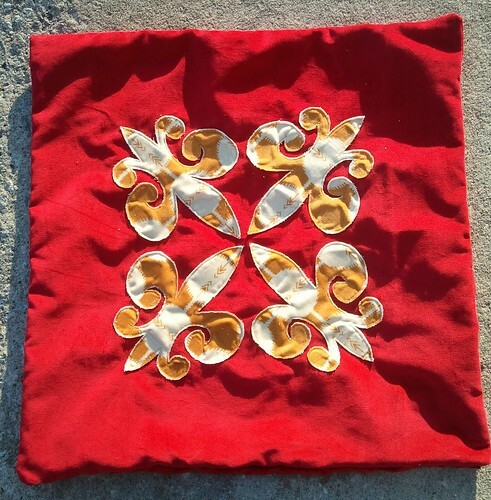 I used some AMH Field Study velveteen and some Robert Kaufman Toscana velveteen to make this pillow cover. 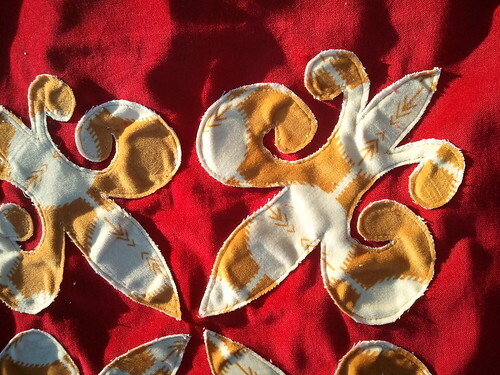 The designs are just fleur de lis raw-edge appliqued to the top with metallic gold thread. I'm looking forward to when it frays more and gets even more snuggly. You can find the template HERE and instructions HERE. Make sure to print the template full scale. That's too bad they didn't want to use your creation. I like it a lot but I will be using other colors when this is made. I have a friend who is a Fleur de Lis nut so I'm going to try to get one made for Christmas for her. She'll love it, especially if it's got purple fabrics. It's got a 70s vibe, but given the way color trends cycle around it's hard to call anything truly dated (ok, maybe if you'd used harvest orange, avocado green, and maize all in one project.) :) It's definitely autumnal, and at least you like it, so yay! I'll bet it's a fab "nap on the couch" pillow with all of its softness.